I am blessed to live in the state of Colorado. I am a fifth generation native. I grew up in a rural town disguised as a small city and learned about life by being in the outdoors. I have driven nearly every major highway and back road from Denver to Grand Junction, from Durango to Walden. I have fished the mighty rivers like the Colorado and Arkansas as well as the small creeks like… well, we keep those names to ourselves, don’t we. 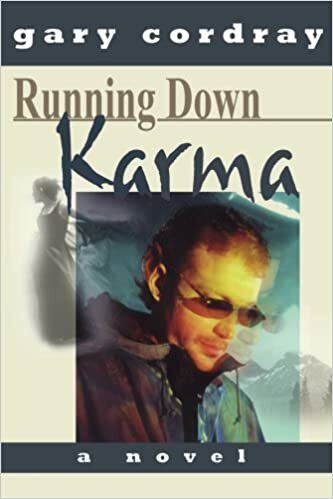 I am aware of the state’s nuances – the majesty of the Rocky Mountains; the overcrowding of the Denver Metro area; the water shortages due to overdevelopment; the rebellious, independent, schizophrenic nature of our Purple-State politics. (Or are we now a green state?) Nonetheless, considering I am not the kind of person who easily affiliates himself with brand names or sports franchises or musicians or political parties or even countries for that matter, I am proud to label myself a Coloradan. And I take pride in displaying our state flag. The state flag of Colorado is iconic. From the blue and white stripes to the prominent red “C” to the gold sphere it envelopes, the flag is beautiful in its simplicity and timeless in its design. No wonder it is being incorporated into so many T-shirts, hats, and logos. 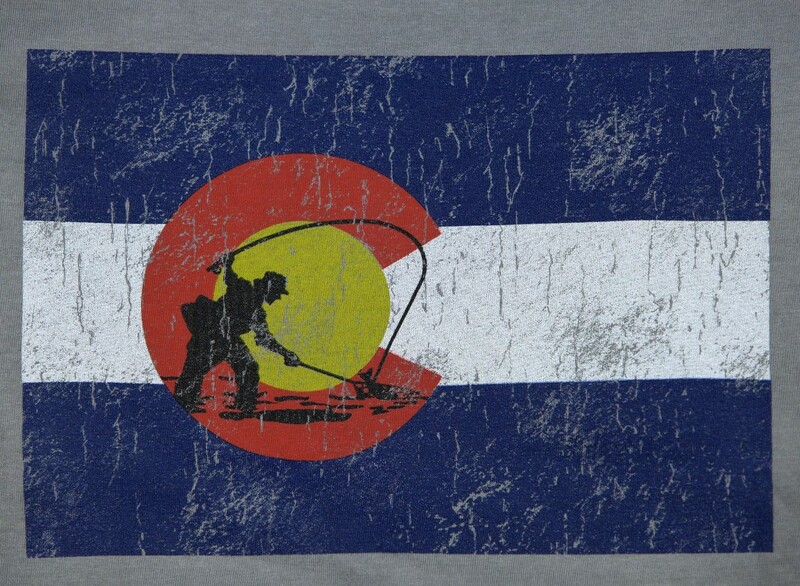 And the fly fishing industry might be neck and neck with the ski industry when it comes to borrowing the image of the Colorado state flag and blending it into their designs. Some might find this disrespectful. They may feel using state pride to hock various wares is insulting, completely un-State-reotic. But how do you unlink Colorado and fly fishing from the collective psyche? Scott fly rods, Ross Reels, Fishpond all call Colorado home. Famous rivers like the South Platte and Frying Pan meander through the state with locals and tourists alike walking their banks in search of trout. The state is a fisherman’s paradise, and using the flag to promote the sport was an obvious extension of passion and pleasure and the landscape in which we enjoy it. First, in order to truly appreciate the various logos, it is good to know the history of the state flag. 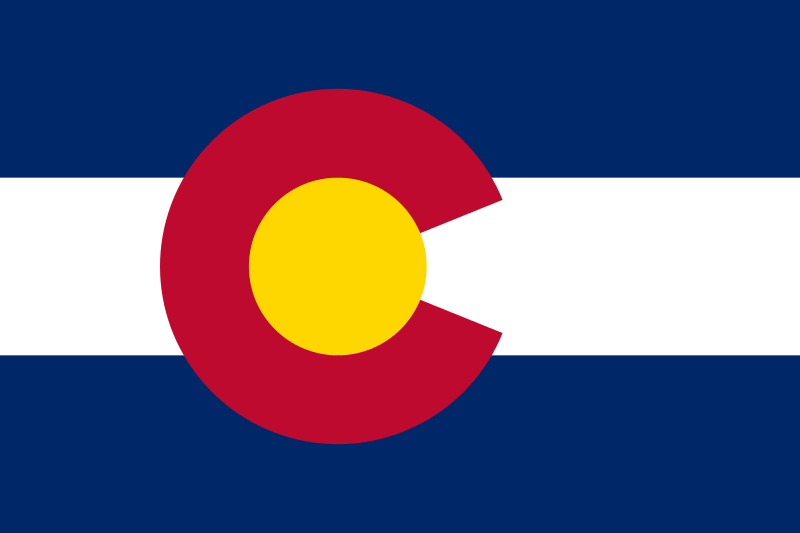 The colors in the Colorado state flag are representative of various environmental features found in the region. The flag is, in essence, a tribute to nature. The white stripe crossing the center symbolizes the snow capped mountains and the blue stripes framing it stand for Colorado’s famous bluebird skies (the ones that make fishing so challenging when stalking fish in gin clear water). The gold nugget inside the red “C” represents the intense sunshine while the red stands for Colorado’s rich, red soil. As fly fishers, we tread on this soil as we hike along streamside, it stains our rivers in June, we wear it home on our boots and waders. We stand beneath that bright sun and weather the intense rays as we stalk our quarry – sometimes your sunglasses, hat, and buff are your most essential fishing tools. Because the blue skies are so big and bright, we learn to fish the east bank in the morning, the west bank in the afternoon and to look for any cover we can find at midday. And that high mountain snow eventually melts and becomes the cool, clear water that feeds our streams and rivers and provides habitat for our beloved trout. In essence, we are immersed in our flag as we fish, making the flag itself perfect for any fishing logo. These primary colors are not just symbolic but are eye-catching as well. Their brilliance reveals our strength, permanence, and simplicity. The overlapping contrasting shapes are both linear and curved suggesting variety and harmony. They are the essential colors needed to make up every other color and are, therefore, eternal. They can also be indicative of the local trout species. The rainbow and cutthroat with their red-stained jaws, sides, and gill plates; the brown and his golden belly during the spawn; the blue encircled dots and white tipped fins of the brookie all bring the flag to life as they swim below the water’s surface. And this design lends itself to logos beautifully: the arc of the “C” as the trout leaps from the water trying to throw your fly; the white field a blank canvas for a brand name or motto; the proximity of colors and shapes imprinted onto the side of a fish or fly pattern. It’s as if the designers were begging us to make the state flag, and therefore the state itself, a part of our daily lives. And in this case, we make it a part of our natural world and our most precious pastime. 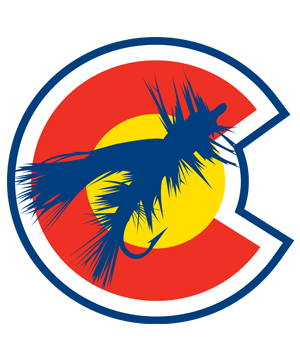 Whether it is the Patagonia fish hat or the Scott flag logo or the Rep Your Water sticker, the Colorado flag seems to be imbedded (literally and figuratively) into the fly fishing culture. I for one embrace it. It allows us, as Coloradans, to express not only the passion we have for our state, but the love we have for the fish that swim in its waters. Wear with pride.